This field guide was the most popular download on DuncanAviation.aero last year. 2010 was a busy year. We fielded countless avionics and paint questions, launched a blog, introduced a series of field guides and beefed up our YouTube channel with some new videos. Here’s a rundown of our most popular resources on DuncanAviation.aero last year. The WAAS/LPV field guide was our most popular download last year. It addresses common questions from operators, differences between approval processes, discrepancies in upgrade costs and considerations for planning an upgrade. The runner-up was an aircraft paint field guide, which targets common misperceptions about exterior refurbishments. It addresses the necessity of regular paint maintenance, aircraft market value considerations and criteria for selecting an aircraft paint service provider. 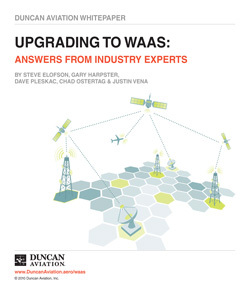 This WAAS eBook continued to attract attention last year with its discussion about the importance of WAAS, why it impacts business aviation operators and how it works. A four minute video about Duncan Aviation debuted on our YouTube channel last year, highlighting our history, service philosophy, customer observations, capabilities and facility locations. Avionics Installation Sales Rep and long-time AEA Advisory Board Member Gary Harpster hosted this five-part WAAS video series based on the presentations he gave across the country last year. The series offers more technical information on legacy interface problems, LPV approaches, GPS signals and operational benefits. More downloads are planned for release this year, so stay tuned! Additional resources that didn’t make our top five list can be found at www.DuncanAviation.aero/downloads.